Blockade, handy fish, sinkholes, more apologies, bad inventions and more! Rare fish with hands - Where they get fish fingers. Sinkhole from (or is it, to?) Hell - The smoking gun “hollow earthers” have been looking for. Editor’s Choice: Posting problems - Still sorry, folks. The 50 Worst Inventions — Time has compiled a list of the 50 worst inventions of all time. Of course, these probably aren’t the 50 worst inventions of all time because at least these dogs saw the light of day, even if it was only for a few moments. Some of them, like hydrogenated oils and Farmville are still, unfortunately, very much with us. 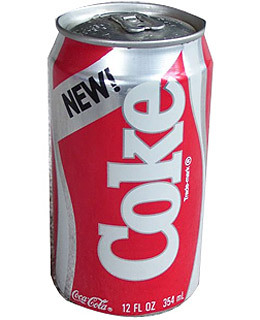 Others like New Coke have gone the way of the Ford Pinto. Gone but not yet forgotten. Wednesday: Chat this week went well into the night; I (Ricky) actually fell asleep at my desk halfway through. We started with a little tech talk: Machi4velli had to do some database programming with MySQL. Upset over this boring drudge, other chatters moved on to nurse jokes and stories, then breeding Dalmatians and working for big pharma: one of our chatters did a stint at Pfizer and Bristol Myers Squibb. Along with stealing drugs, ethics of drug companies and other various topics, somehow Ray Comfort came up. This led to other crackpots, such as a guy who claims Bigfoot is the result of original sin. If you make a statement about a nonexistent creature, I guess technically you are correct. With bad arguments in mind, talk moved onto a blog post on Good Math, Bad Math regarding the standard Creationist claim that evolution violates the Second Law of Thermodynamics. An interesting counter-argument is that it is not known whether evolution is a net decrease (with the system being Earth alone) in entropy as Creationists claim. The topic became more general when it was remarked how offended crackpots become when you try to help them improve their arguments. Examples included AIG’s Arguments Creationists Shouldn’t Use and our old friend Mozina. To round off the night, chat ended with wacky religious claims. Giant airplane-mounted telescope sees first light! A somewhat baffling result: atheists are like aspies, but not? When Good Thinking Goes Bad: How Your Brain Can Have a Mind of Its Own, by Todd C. Riniolo. “In 1975, the Environmental Fund sponsored a full-page advertisement in leading newspapers, which predicted that ‘the world as we know it will likely be ruined before the year 2,000,’ due to the assumed inability of world food production to keep pace with the increase in population. The statement was endorsed by some of the finest thinkers of the time — scientists, scholars, and other professionals who had spent their careers applying the principles of critical thinking to their chosen disciplines. Nonetheless, in this instance, they all failed to use the same rigor in assessing the probability of looming disaster and badly miscalculated. There were 11,677 daily visitors this week. There were 51,706 daily visitors in May, 2010.